Osteoporosis means “porous bones”. Our bones are strongest at about age 30, then begin to lose density. According to the Centers for Disease Control and Prevention, 16% of women and 4% of men over the age of 50 suffer from osteoporosis. This might seem like a small percentage, but in reality, osteoporosis affects over 200 million people. Because the disease is so prevalent, many adults with elderly parents worry that their loved one may be at risk of becoming another statistic. If you’re wondering about your loved one’s chances of developing osteoporosis, we have the resources you need. From symptoms to prevention and treatment, read on to learn everything you need to know about osteoporosis. Bones are living tissue, and like other living tissue in the body, bone tissue is constantly broken down and new bone tissue is built. Osteoporosis is a disease in which new bone doesn’t build up as quickly as old bone is broken down, making the bones weak. Weak bones are much more susceptible to breaking if the person should fall. Even placing light stress on the bones, such as coughing or bending, may cause a fracture. You already know that calcium can help build strong bones. But not getting enough calcium isn’t the only cause of osteoporosis. In fact, researchers now believe that osteoporosis is caused by a combination of things. Low Estrogen in Women: Estrogen deficiency in women can cause osteoporosis. After menopause, bone loss is accelerated due to a quick drop in estrogen. As time goes on, the risk of osteoporosis increases since most women lose more bone than they replace. Low testosterone in Men: Similarly, men who have low levels of testosterone are more susceptible to osteoporosis. Testosterone is necessary for bone health since men convert testosterone into bone-preserving estrogen. Vitamin D deficiency: Studies show that too little vitamin D can result in weaker bones and increased bone loss. This is because vitamin D acts more like a hormone than a vitamin, helping the body absorb and use calcium. Sedentary Lifestyle: People who spend a lot of time sitting have a higher risk of osteoporosis than do those who are more active. Alcohol and Smoking: Both alcohol and smoking can contribute to bone loss too. Alcohol can affect bone remodeling while smokers tend to have a higher risk of fracture than non-smokers. Certain Medications: Certain medications can increase your loved one’s risk of developing osteoporosis. The most common are corticosteroids which include medications like cortisone, hydrocortisone, glucocorticoids, and prednisone and are typically used to treat asthma, rheumatoid arthritis, psoriasis, colitis, and more. Certain Medical Conditions: Numerous medical conditions can lead to bone loss. This includes conditions like cystic fibrosis IBD, kidney or liver disease, cancer, lupus, rheumatoid arthritis, and multiple myeloma. As we age, our bone mass deteriorates, increasing the risk of fractures – especially among the senior population. Every year, osteoporosis is responsible for more than 1.5 million fractures, including nearly 300,000 hip fractures, 700,000 spinal fractures, 250,000 wrist fractures, and other injuries. Knowing as much as you can about osteoporosis and your elderly parent’s risk is an important step in helping your parent avoid developing the condition or resist potentially serious consequences if they have already developed it. As with many health conditions, there are both risk factors that your aging parent can influence and those that they cannot. Understanding both of them is key to monitoring your parent’s health and helping them to stay healthier and stronger as they get older. Gender: Women are four times more likely to get osteoporosis than men are. Age: People over the age of 50 are at a higher risk for the disease. Adults 90 years of age or older have a more than 60% risk of having osteoporosis, more than five times the risk of someone 60 years old. Build: Osteoporosis is a condition characterized by the loss of bone mass. Since people who have small body frames have a lower bone mass to begin with, they are at much higher risk of developing the condition than people with a larger body frame. Heredity: A family history of osteoporosis increases risk. Having a parent or sibling with osteoporosis puts one at a greater risk, especially if your parent experienced a hip fracture. Ethnicity: Osteoporosis does not discriminate. Men and women of all ethnic groups can develop the disease. Elderly adults who are of Asian or Caucasian descent or are white are more likely than other ethnicities to develop osteoporosis. What Are the Possible Complications of Osteoporosis? 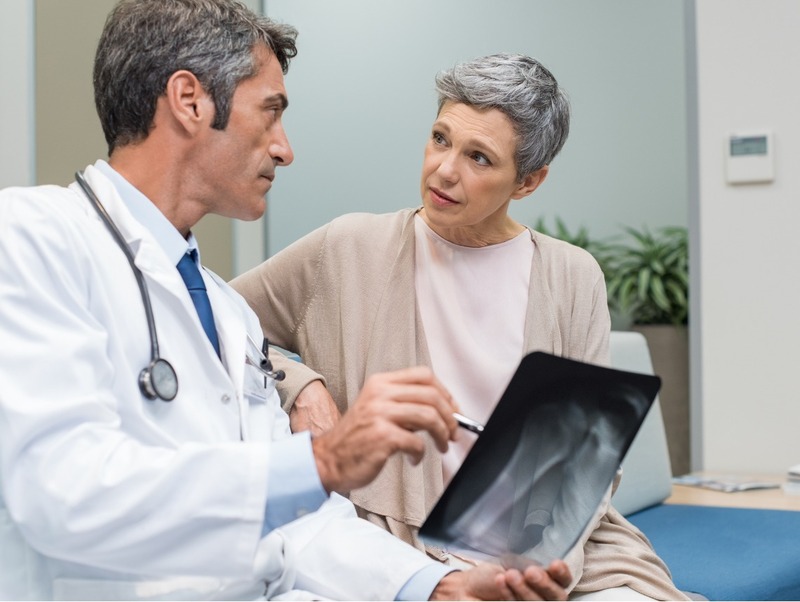 Understanding the possible complications that can arise as a result of osteoporosis can help you work with your loved one’s doctor to create a plan designed to manage their needs and protect them as they age. The most serious complication of osteoporosis is an increased chance of bone fractures, especially the spine or hip. Bones with lower mass are more fragile, which means that they are more likely to break in the event of an accident. Even a minor impact, such as walking into a piece of furniture or having a slight fall, can cause a severe fracture for an elderly adult with osteoporosis. The effects of a fracture on a person with osteoporosis can be devastating. Not only do these injuries cause extensive pain, but they can cause loss of mobility and a lasting negative influence on their ability to physically function. This can quickly diminish the quality of life of your loved one and can even increase the risk of death. Osteoporosis can be challenging to diagnose because it happens gradually and tends to be relatively painless and undetectable in the beginning. If you suspect your loved one has bone loss, their doctor may perform one or more of the following tests. A bone density test is the best option the doctor has for predicting your loved one’s future bone health. A bone density test checks bone strength that will determine the presence of osteopenia or osteoporosis, as well as how susceptible the bones are to fracture. All women 65 and over, with osteoporosis risk factors and all post-menopausal women with a broken bone, should be tested. A bone density test uses X-rays to measure how much calcium and other bone minerals there are in one square centimeter of bone. Typically, the higher the calcium and bone mineral content, the better, as this represents how dense the bones are. A central densitometer is a machine that measures the density of the central, stabilizing parts of the skeletal system such as the spine and hips. Note that there are various editions of this machine including a dual-energy X-ray absorptiometry (DXA) and a quantitative computerized tomography (QCT). Each of these measure bone density in different ways. Peripheral densitometers can also measure bone density but with a smaller device. That makes this option great for smaller areas of the body like the wrists. If your loved one’s test confirms osteopenia or osteoporosis, the doctor may recommend a follow-up scan of the spine or hips to confirm the diagnosis. Although there is no way to completely reverse osteoporosis, your loved one can manage it. Better yet, some of these treatments can be done every day through diet and exercise. When it comes to calcium, your elderly loved one should aim to get 1,200 milligrams a day. Sometimes it’s not always easy for your elderly loved one to get the calcium they need through their food. Supplements can help, but be sure to consult their doctor first. Vitamin D is necessary for calcium absorption, so doctors recommend taking between 600 and 800 international units a day. Again, check with your loved one’s doctor before starting any new supplements. A diet high in phosphorus can contribute to bone loss. If your loved one has osteoporosis, have them avoid or cut back on red meat, soft drinks, and any foods that have phosphate food additives. Exercise can help build strong bones and slow bone loss. Weight-bearing exercises like walking, running, and stair climbing help to protect bone density. If possible, your loved one should do these types of exercise at least three times a week for around 45 minutes. Some other ideas for weight-bearing exercises include dancing, tennis, and aerobics. While exercises like cycling and using an elliptical are great for the heart, these exercises don’t put enough stress on the bones. Depending on the severity of bone loss, your loved one’s doctor may prescribe medications to treat their osteoporosis. These medications are often referred to as bisphosphonates and come in the form of pills, infusions, or a man-made form of the parathyroid hormone. When it comes to preventing osteoporosis, living a healthy lifestyle is key, including good nutrition and regular exercise. Your loved one can protect their bones and significantly reduce their chance of osteoporosis by avoiding drinking more than two alcoholic drinks a day and by avoiding or stopping smoking. Eating a diet rich in calcium or supplementing with calcium and vitamin D is another way your loved one can protect their bones. Getting regular exercise and focusing on weight-bearing activities provides significant benefits, not just for osteoporosis prevention, but for the overall health of one’s body and mind. Best of all, no expensive gym equipment or memberships are needed. Simply walking for 45 minutes three times a week will yield improvements over time. If you are looking for additional ways to help your female loved one prevent osteoporosis, consider talking to their doctor about hormone replacement therapy (HRT). HRT uses estrogen by itself or a combination of estrogen and progestin to preserve bone and prevent fractures. Many health insurance companies will cover a bone density test, as does Medicare. But you need to check ahead of time to see if your plan does or if Medicare will pay for your loved one’s testing. If your elderly loved one has recently been diagnosed with osteoporosis or you are concerned that they are at increased risk of suffering such a condition, now may be the ideal time for you to consider home care services. Starting home care for them can make a tremendous difference in their health and quality of life. The highly personalized services of an in-home health care provider can help your elderly parent understand the risks associated with the condition and guide them through lifestyle choices that will help them to stay safer, healthier, and more comfortable. This can include encouraging them to eat a healthier diet, guiding them through activities and exercises that will keep their bones and tissues as strong as possible, and offer reminders to keep them compliant with the medications and guidelines from their doctor. Physical support and assistance can help to reduce fall risk and protect your parent while they are handling basic daily tasks, such as bathing, navigating the home, and toileting. WebMD: Osteoporosis: Are You at Risk?